One of the most disputed issues in the current coalition talks is whether war refugees should be allowed to bring their families to Germany. While parties refuse to compromise, refugees live with the consequences. Jihad, a neatly shaven man with salt and pepper hair, pulls up a recent picture on his phone of his daughter riding her pink bike for the first time. The Syrian never got to see his daughter making her first wobbly journey on two wheels though – the photo was sent to him by his wife. He hasn’t seen his family in over two years. As is the case for over 200,000 other refugees in Germany who have only been granted “subsidiary protection”, Jihad’s family cannot come here. In early 2016 the public mood in Germany began to turn against the hundreds of thousands of asylum seekers who had arrived in the country over the preceding months. Mass sexual assaults by men from North Africa and the Middle East in Cologne at the start of the year unleashed a public debate on the compatibility of refugees with German values. The government responded by putting family reunifications for war refugees on ice. As of March 2016 only people who can prove they were personally persecuted in their homeland have the right to reunite with their family in Germany. Now the issue of Familiennachzug (family reunions) has once again come to prominence. It threatens to become the make-or-break issue on which coalition talks to form a new German government could founder. Despite weeks of negotiations, the Green party are still seas apart from the conservative Christian Social Union (CSU) on the issue. While the Green party are demanding that, as of March 2018, war refugees be able to bring their families to Germany, the Bavarian CSU want to maintain the embargo. Green party leader Katrin Göring-Eckardt has accused the CSU of betraying their commitment to family values. The CSU though, have lost voters to the far-right Alternative for Germany, as German voters protested against the level of immigration that has taken place over the past two years. Jihad and his family fled the violent chaos of Syria in 2015. They came via Egypt intending to take a boat together to Italy and then travel the 2,000 kilometres or so up to Berlin where four of his siblings, who arrived in 1992, already run a small restaurant in the west of the city. The restaurant is wooden and extended with plastic sheeting. In his home country it’s usual for extended families to live together as a core unit; it takes something big to split them up. Leaving his family was not a decision Jihad took lightly. 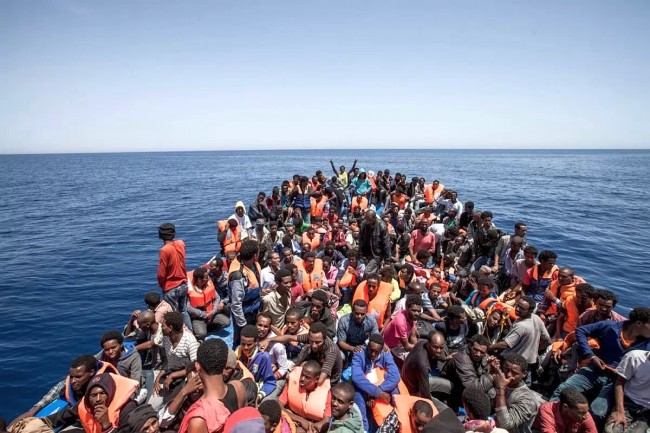 In 2014, reports of floating bodies from boats intentionally shipwrecked by traffickers flooded the media and Jihad says he was forced to make an unwelcome choice. As the head of the household, he made a bid for a safe and stable life alone – in order to pave the way for his wife and children – never expecting that protecting them would mean a long term, perhaps permanent separation. Birgit Laubach, head of the legal staff of the Green parliamentary group since 1990, sees Germany’s measures as a threat to family unity which contravene basic German law, the European Convention on Human Rights (Article 8) and the UN Convention on the Rights of the Child. Figures provided by the German immigration authority show asylum seekers are more likely to be men than women and for the last ten years this trend of gender inequality is consistent across Europe. Yet this is not because refugees in general are more likely to be men. In statistics registered by the UN, out of the 2.1 million refugees registered in Egypt, Iraq, Jordan and Lebanon there’s an even split in gender: about 50.5% are women and 49.7% are men. According to an UNHCR report, there are several possible reasons for this discrepancy, perhaps most obviously that these bordering countries more easily accessible by potentially less physically able members of the family – women and children. The UN also reports that these countries are more similar in their cultural attitudes, and more likely to recognize the concept of dependency when it comes to the wider family. Widows, elderly parents or ‘adult’ but not yet married women are accepted as economic dependents, whereas the European definition of core family, even when refugees are accorded a full asylum status with family reunion, is limited to spouse and adolescent children. As heads of the household, men like Jihad are more likely to make the journey to Europe because of the real or perceived dangers. When male children of the family left behind reach adulthood, they are more able to do the same thing, whereas women travelling alone without a man, would risk – as they see it – more than just their lives: they risk their honour. There are different perspectives on why. According to one Afghani woman, a refugee who preferred to remain nameless, a woman’s honour is so precarious and the loss of it so harmful to the entire family, that no man would willingly compromise the honour of a woman in his family unit. Research conducted by Amnesty International in 2016 gives a different, more general view. “Women and girl refugees face violence, assault, exploitation and sexual harassment at every stage of their journey, including on European soil,” the NGO states. Jihad’s family are comparatively lucky. When the family fled to Egypt, his parents accompanied them. ”The only thing that keeps me going is knowing my wife is taking care of my parents, and my father is returning the favour,” he says. Nevertheless Jihad still hopes for family reunion.